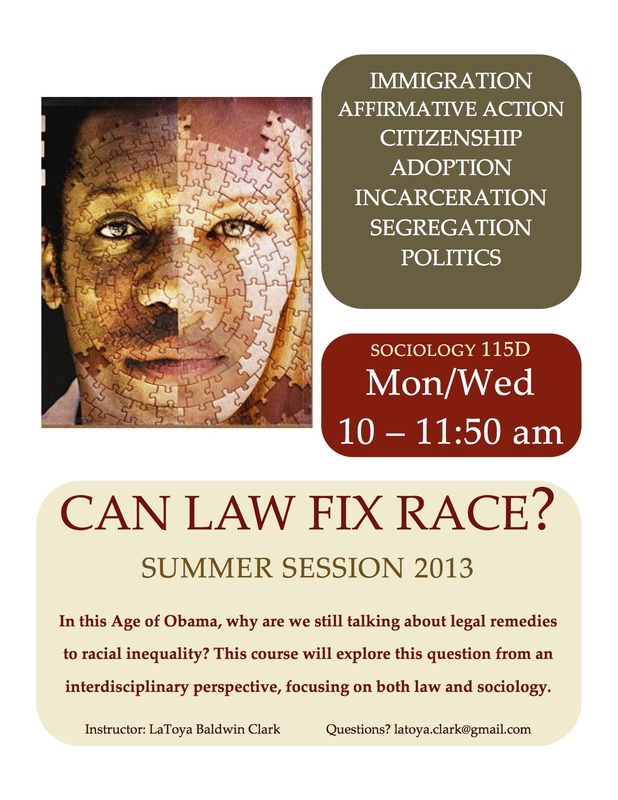 In the Summer of 2013, I taught a class at Stanford University titled, “Can Law Fix Race?” In this class, comprised of 11 students, we discussed issues of race in law, and pondered whether legal interventions can solve problems of racial inequality in the United States. This class, which I developed, combined student discussion with multi-media presentation and classroom activities. Assessments included an in-class quiz, a take home exam, discussion leadership, attendance and participation, and a final project in which students wrote an opinion-editorial piece (“Op-Ed”). Teaching this class was a highlight of my graduate student experience. I originally wanted to teach the course because I noticed that teaching was a gap in my professional experience. I realized, however, that more than filling a gap this course opened my eyes to the joys of teaching. I thoroughly enjoyed sharing the knowledge that I’d accumulated over the last several years as I became an “expert” in my field. I was even more excited, however, at my students wholehearted engagement with the materials and their willingness to ask questions and challenge assumptions. I sincerely hope that my students gained an appreciation for the social construction of law, and that perhaps the course persuaded a few of them to pursue studies in either the social sciences or law.